While you’re out on your deck enjoying the sun and spending time with friends and family, it’s easy to forget that your deck needs annual maintenance to preserve its condition and prevent deterioration. To prevent potentially costly repairs, you should be sure to have wood protector or a polyurethane treatment applied. Additionally, having deck maintenance performed once or twice a year by an experienced handyman can help prevent other kinds of structural problems. A Sears Handyman can re-screw or tighten boards, check the deck for wood rot, have the hangers replaced, or perform other on-the-spot repairs as necessary. 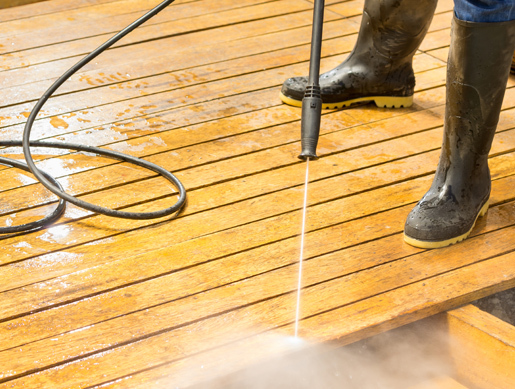 To correctly complete the deck refinishing process, the boards first need to be sanded so they can absorb a special cleaning solution, which purges the wood of substances likely to lead to wood rot. Next a special wood protector product is applied to protect the wood from precipitation. 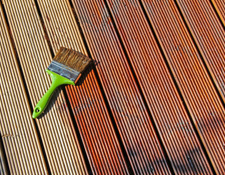 Your deck will require cleaning at the start of the refinishing process. Tree limbs, leaves, and lawn debris all collect on your deck and in its crevices over time and need to be washed out. 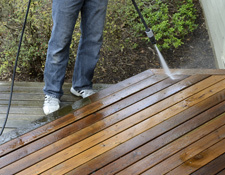 To accomplish this, Sears Handyman experts use high-velocity pressure washers that apply strong streams of water to clear debris from the surface and in between boards. Once the debris has been cleared, bleach solutions made specifically for deck cleaning will be applied and thoroughly rinsed off. If you need help with your annual deck cleaning or don’t have the necessary equipment, you can rely on Sears Handyman Services technicians to help out. Our technicians have the right mix of equipment and experience to get the job done right. Call today and schedule service to get your deck cleaned correctly so you can get back to enjoying it. Decks need to be sealed to ensure their protection from rain, snow, and the bleaching effects of the sun. Without an application of sealer or wood protectant, your deck will absorb water from precipitation and be at risk for damage. Deck sealing involves several steps that should begin with removing all objects from the deck, followed by an inspection for loose nails, bolts, and boards that should be secured before the staining begins. Next, the deck will need to be cleaned before it can be sealed. 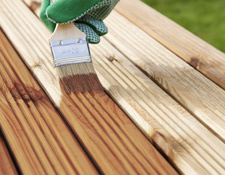 Once the deck has been cleared, inspected, and dried, the sealant can applied. This solution should be applied carefully and evenly to ensure the appearance of the wood remains consistent. Certain environmental factors like temperature, expected precipitation, and sun exposure will affect when a deck can be sealed. Once the solution has dried (after a period of about 48 hours), you can return your furniture to its former place and begin enjoying your deck without worrying about its ability to resist water and sunlight. For both deck refinishing and deck sealing, you can contact Sears Handyman Services. Our technicians can advise on the best options for your deck, its wood type, and your aesthetic preferences. Our technicians will evaluate your deck before starting any work and listen carefully to what you’d like to achieve.